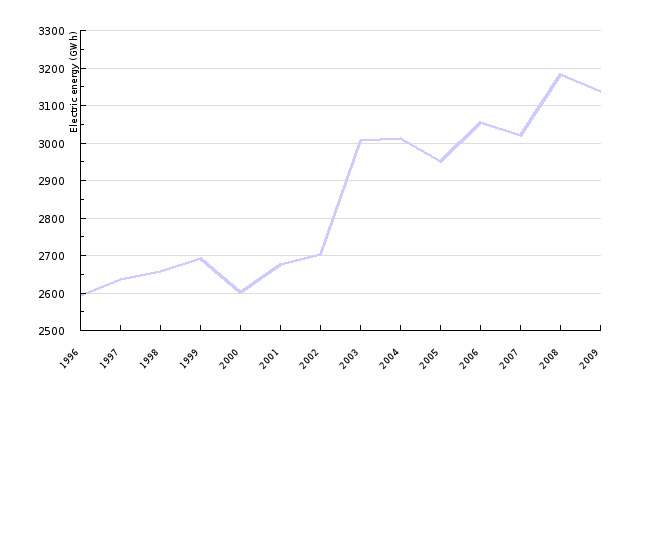 Household electricity consumption is increasing and amounted to 3,000 GWh in 2009. The share of households equipped with electricity-consuming appliances is increasing as well. These include e.g. dishwashers, clothes dryers, mobile phones, CD players, microwaves, and personal computers. Despite the improved energy efficiency of some appliances, electricity consumption has not decreased, as the number of household appliances continues to increase rapidly, which also contributes to excessive quantities of waste. This indicator shows the trends in household electricity consumption and the changes in household equipment with regard to electricity-consuming appliances. · to ensure a free flow of these products on the internal market of the European Union. Most impacts of electricity use result from its production. However, consumers can influence the selection of the electricity source, as (pursuant to a 2003 regulation) all companies are now required to provide details of the sources of electricity (i.e. fossil fuel, nuclear, renewable sources) being delivered to customers. In the EU, companies producing and distributing electricity are increasingly marketing electricity from renewable energy sources. Increasing energy consumption in households is a consequence of the improving standard of living, which results in households with large and small household appliances (air conditioners, clothes dryers, increasing number of lights, etc. ), a larger number of TV sets, an increasing number of households, improving information and communication technology in households (growing number of broadband internet connections, growing number of computers and their use in households) and use of other electronic devices (mobile phones, wireless phones, audio-video equipment, etc.). According to the data provided by the Statistical Office of the Republic of Slovenia, household electricity consumption is increasing in Slovenia. Between 1996 and 2002 it increased by 4%, which was followed by another increase, by 12 percentage points, in the period from 2002 to 2003. Consumption stabilised after 2003 and increased by around five percentage points between 2003 and 2009. Since 1990, the share of households equipped with energy-consuming goods has been growing. The main increase was recorded in the number of households equipped with a dishwasher, HI-FI audio devices, clothes dryers and other products that became widely used by households in 2000, such as mobile phones, CD players, microwaves, and personal computers. For instance, only 22% of households owned a mobile telephone in 2000, but by 2009, this percentage had risen to almost 90%. In the same year, more than 96% of households owned a refrigerator, a washing machine and a colour TV. More than 80% of households had a deep freezer and a mobile phone, 60% of all households owned a personal computer and 50% of households owned a HI-FI audio device or a CD player, a dishwasher and a microwave. Around 25% of households also used a clothes dryer. In 2009, most electricity (1,000 GWh or 32%) in households was used for major household appliances (refrigerators and freezers, washing machines, clothes dryers and dishwashers, ovens and microwaves). Slightly more than 600 GWh (19%) of electricity was used for sanitary water heating and 350 GWh (11%) for heating of dwellings. Electricity consumption for personal computers and TV sets amounted to 290 GWh (9%), while 280 GWh (9%) of electricity was consumed for lighting. Consumers can indirectly reduce the impacts of rising electricity consumption by reducing their own electricity consumption, which is enabled by greatly improved energy efficiency of major household appliances as well as energy efficiency labelling of appliances (which now means that the price is no longer the only factor in purchase decisions) and awareness-raising. In using numerous electric and electronic household appliances, particular attention should also be paid to the environmental impact of the waste disposal process. Energy labelling of household and other appliances presents one of the instruments foreseen for achieving final energy savings provided for in the National Energy Efficiency Action Plan for the Period 2008–2016. Similar to Slovenia, other EU countries are also witnessing an increase in the share of households equipped with electric and electronic equipment. Energy consumption is increasing despite the improvements made to the above-mentioned equipment. Various studies have shown that despite the improved energy efficiency of appliances by a factor of 2 to 3 in recent years, total household electricity consumption is increasing, mainly due to increased ownership of household appliances. The ‘reverse effect’, when consumption of energy does not decrease despite numerous improvements, has been observed with electronic devices such as TVs, DVD players and personal computers. On average, European households have noted an increase in total energy consumption attributed to these electronic devices, as many households own two or more televisions and personal computers. In addition, an increasing number of electric and electronic devices in households leads not only to increasing energy consumption but also to increasing waste generation. 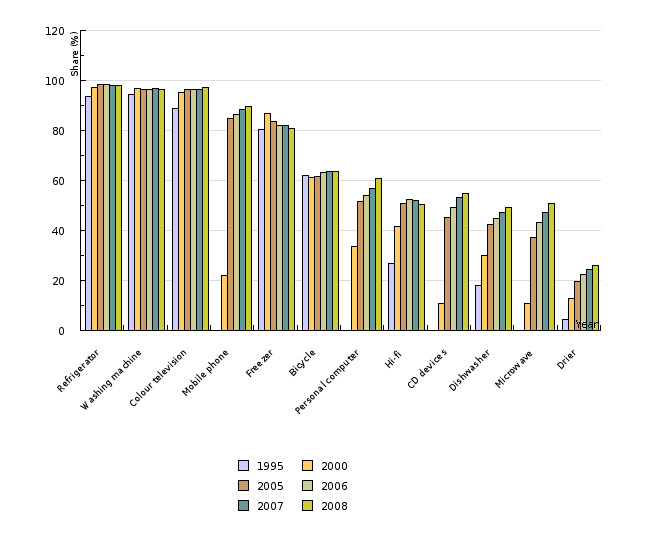 Methodology and frequency of data collection for the indicator: The data on household electricity consumption is derived from the Statistical Yearbook of the Statistical Office of the Republic of Slovenia, July 2009, Chapter 19.1, Balance of production and consumption of electricity (GWh), Slovenia, annually. The Statistical Office of the Republic of Slovenia collects the data on the equipment of households with durable consumer goods through a questionnaire entitled 'Household Budget Survey'. The data for the period of three years has been calculated to the middle year and taken into account in the interpretation of the results for the reference year. 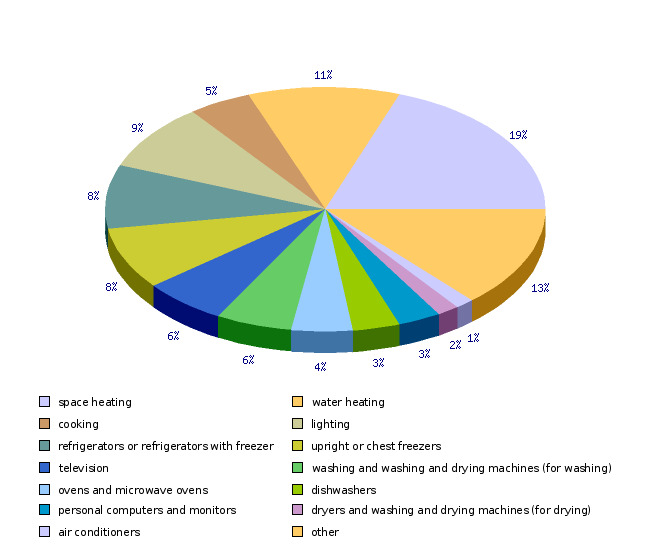 The data is published on the SI-STAT Data Portal in a dataset entitled ‘Share of households with certain consumer durables, obtained in August 2009. Data processing methodology: Equipment of households with durable consumer goods: The data is provided for the last year available, two middle years and the first year available.